Today’s AC power is littered with byproduct from the operation of millions of personal computers, satellite set-top boxes and myriad other noise inducing devices. The new MPC1500 Power Controller provides total isolation, low noise, and maximum power transfer to enable the best performance possible from your McIntosh components. The MPC1500 features a large torroidal transformer that has been specially wound to act as a low pass filter to remove unwanted harmonic noise on the incoming AC line, while a quick-acting surge suppression circuit features a clamping voltage onset of about 2V above peak nominal voltage for the best possible product protection. Our trademark illuminated glass front panel features two custom “blue eyes” meters for instant recognition of current and voltage. Six medical-grade duplex outlets allow for the connection of up to 12 separate components. Total current draw for all components is 1,350 Watts, 11.2 Amps. 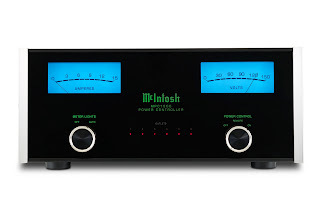 Get more details about McIntosh MPC1500 on the website.